OH MY GOSH!!! It's happening--the Cubs are going to the World Series!!!! I've been a lifelong Cubs fan (probably because my mom watched Cubs baseball all summer long while preggers with Twin Sista and me) and I couldn't be happier. 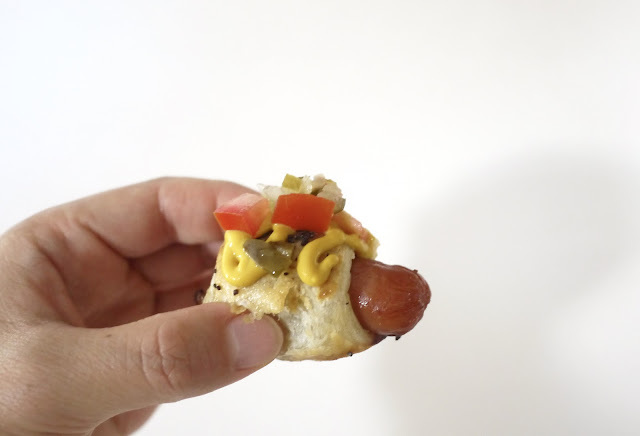 And in honor of the Cubs, I made a little baseball snack, filled with hometown pride: Mini Chicago-Style Weenies. They have the essentials: celery salt, mustard, onions (jazzed up, caramelized style), relish and tomatoes and never any ketchup. Sport peppers are lacking since they're harder to find outside of Chicago. 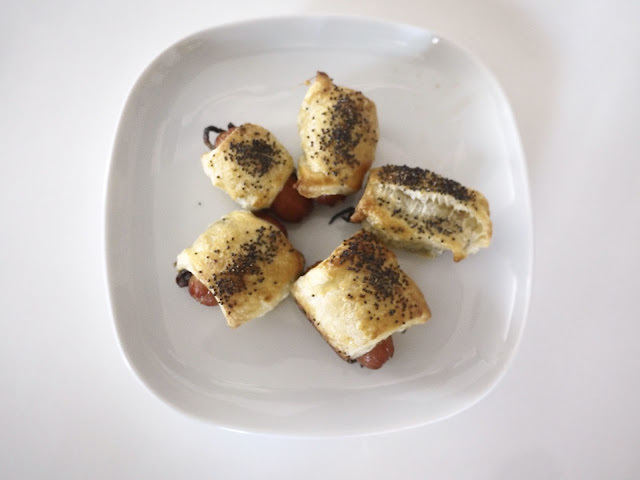 And they're bite-sized, wrapped in puff pastry dough so they're perfect to enjoy while perhaps watching the Cubs play in the World Series! 1. Prepare caramelized onions--this can take up to 50 minutes, or you can opt for an easier option of using diced raw onion as a topping. Also thaw pastry dough while getting onions prepared. 2. Once dough is thawed, on a floured surface, roll out pastry dough until it's pretty thin. Cut dough into 3 inch long triangles or rectangles. 3. Place mini hot dog onto dough strip and add 1/2 teaspoon of caramelized onions. 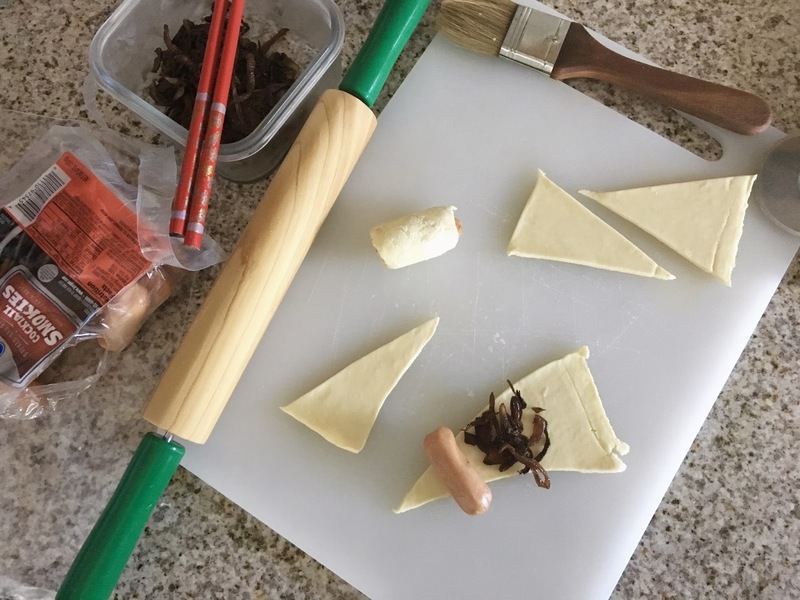 Roll to wrap dough around hot dog. Repeat with remaining hot dogs and puff pastry strips. 4. Brush beaten egg onto tops of wraps. Then sprinkle poppy seeds. Place onto a parchment-lined baking sheet and refrigerate for 15 minutes. 5. Preheat oven to 450 degrees. 6. After weenies have chilled, bake in oven for 10-12 minutes or until golden. Remove from baking sheet and cool on a rack for 5 minutes. 7. 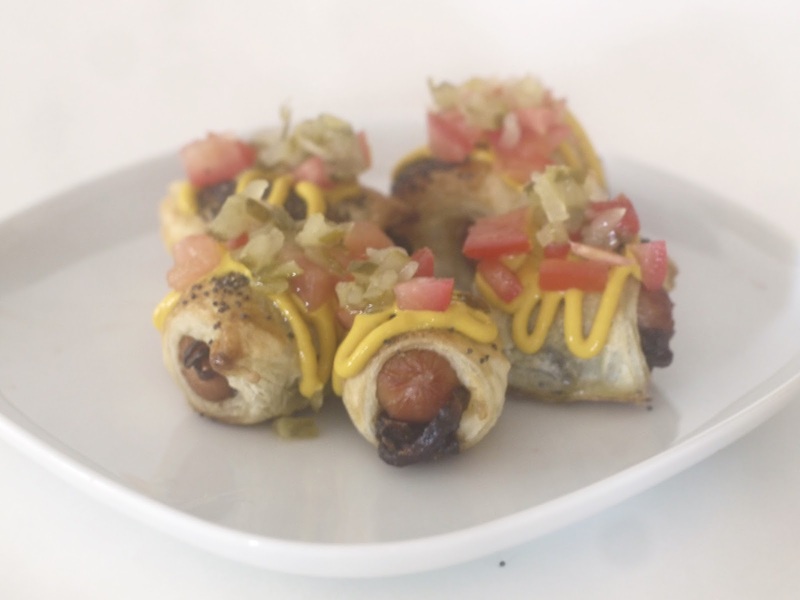 Top each weenie with mustard, tomatoes, relish and a pinch of celery salt.